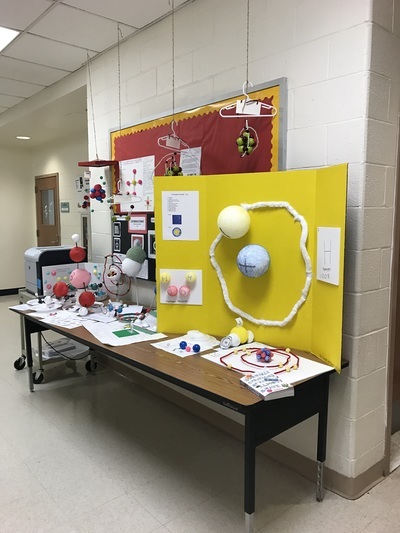 Every year, the Bergen County Utilities Authority (BCUA) sponsors an Environmental Awareness Challenge Grant program whereby Bergen County schools are eligible to receive grants of up to $1000. 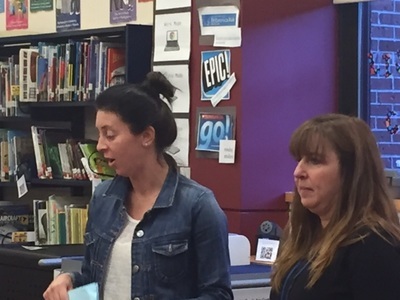 This year was the 10th annual program and Mrs. Hafers, shown here with Dr. Ben-Dov at the check presentation ceremony, won two grants, one each for Roosevelt and Cherry Hill Schools. In order to be eligible, a school must have a functioning recycling program in place, or use the money to implement one. 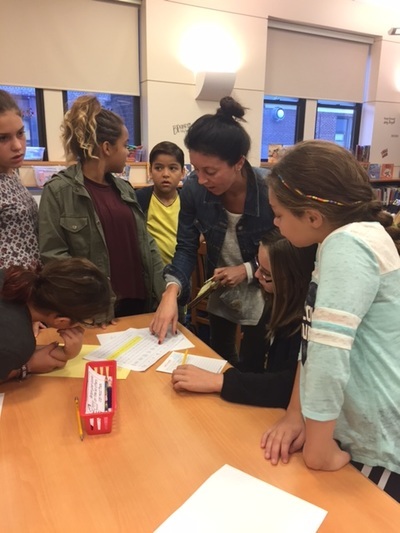 Last year, Mrs. Hafers kicked off a 6th grade Capstone CREATE class and challenged them with solving a real problem in our community: enhancing our school's recycling efforts. The idea was to address a real issue in our local school community where the students would make an impact and leave a lasting legacy before moving on to middle school. The class was an integrated CREATE class, pulling students from all 3 CREATE disciplines together, and was broken down into two phases: a short term "quick hits" phase and a long term research and proposal phase. Only the short term phase was concluded by the time the grant application was due, so that was the focus of our request. 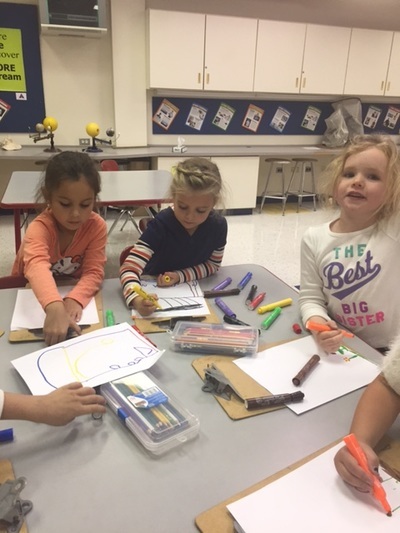 Students spent the first two weeks observing current practices among the students in the school, both in classrooms and lunchrooms. They identified quick and easy changes for immediate impact and noticed that there were not enough recycling containers in either the hallways or classrooms to handle the increased volume that we anticipated with better education and signage to remind everyone to recycle. 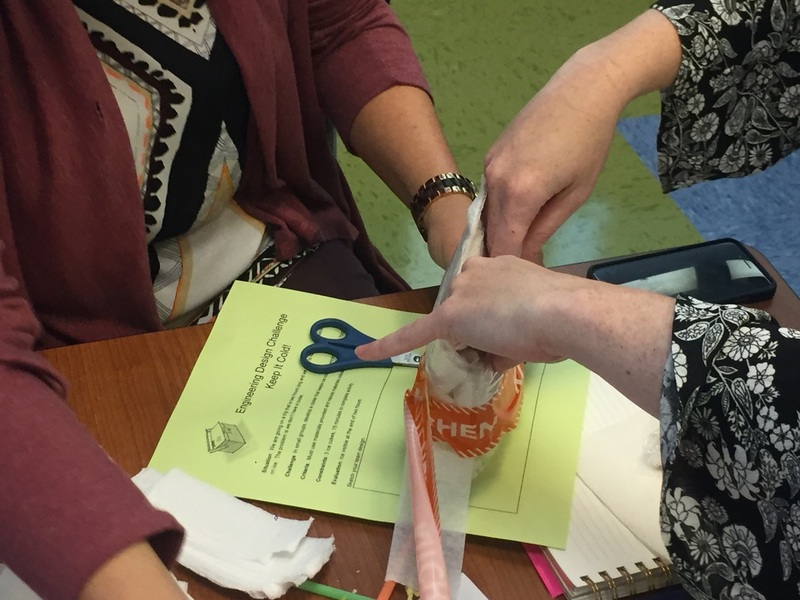 Some classrooms and offices didn't have any recycling bins. Very often if a recycling container was not nearby, the recycling item was tossed in the regular trash. 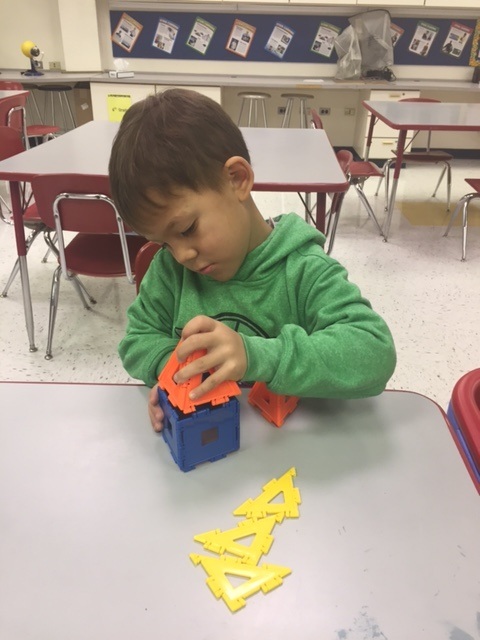 We requested the grant money to purchase additional recycling containers for both the hallways and classrooms to increase our overall collection to and make it easier for recyclable items to end up in the right place. The check presentation ceremony was held on October 7, 2016, and the orders for those containers will be placed this month. 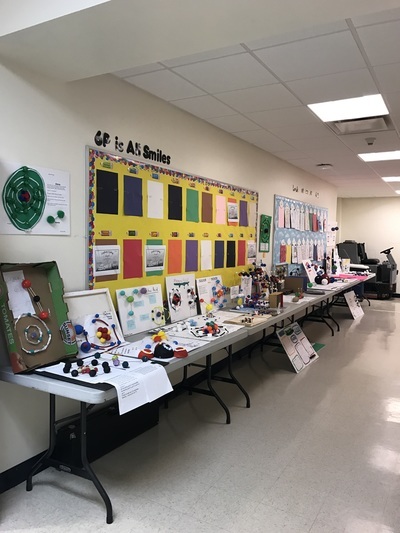 Also this month, this year's 6th graders begin their Capstone class and will have the opportunity to continue the great recycling work begun last year. There is still much to be done. There were many great ideas suggested by last year's class during their final presentations that we need to prioritize and implement. This year's class will also be challenged to think creatively and imagine new solutions of their own to take us further along our path to being more "green". Perhaps they will suggest something that would be appropriate for another BCUA grant! 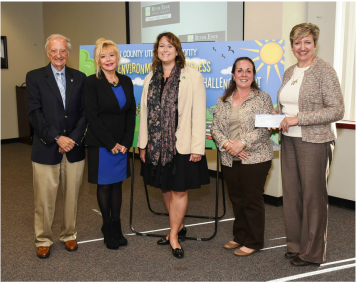 Photo curtesy of the BCUA 2016 Environmental Awareness Challenge Grant Check Ceremony at Bergen Community College on October 7, 2016. Pictured from left to right are: BCUA Commissioner George P. Zilocchi, Superintendent of River Edge Schools, Dr. Tova Ben-Dov, Bergen County Freeholder, Vice-Chair Woman Tracy Silna Zur, BCUA Commissioner Catherine T. Bentz, and CREATE teacher Mrs. Nancy Hafers. 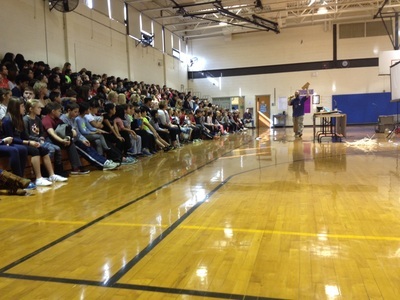 ​River Edge Schools are committed to stomping out bullying! According to antibullying.com, "The anti bullying movement was created in response to the steady increase in bullying across not only the United States but the world... and the movement gives a voice to the otherwise voiceless. It provides bullied kids (and young adults) with a sense of dignity and self worth along with a plan of action. " 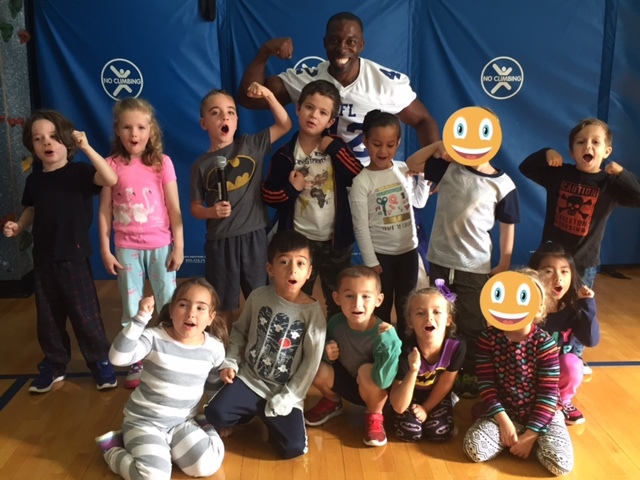 Kindergarten students at Roosevelt Elementary School participated in an anti-bullying assembly with former athlete and motivational speaker, Dwayne West. 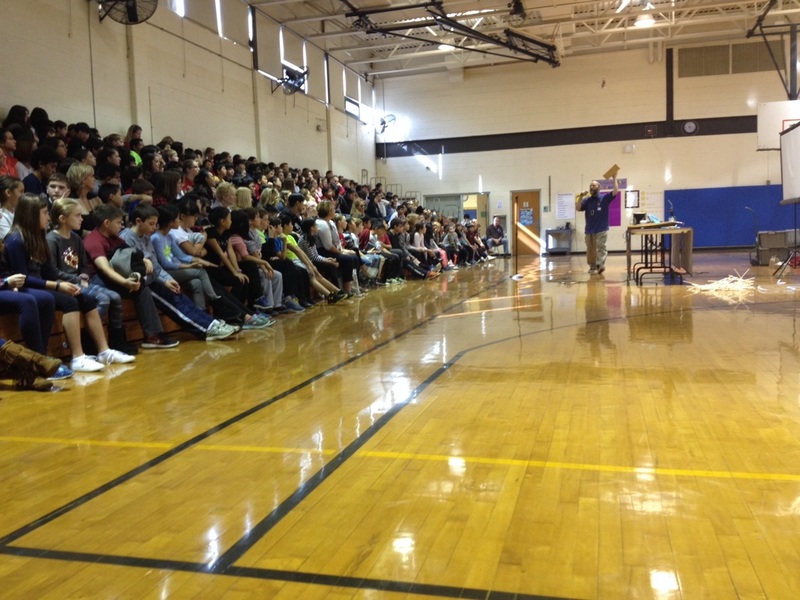 The video on the left below show Dwayne West speaking to the students about being focused and strong. Students at Cherry Hill School were dazzled with amazing BMX bicycle performances. 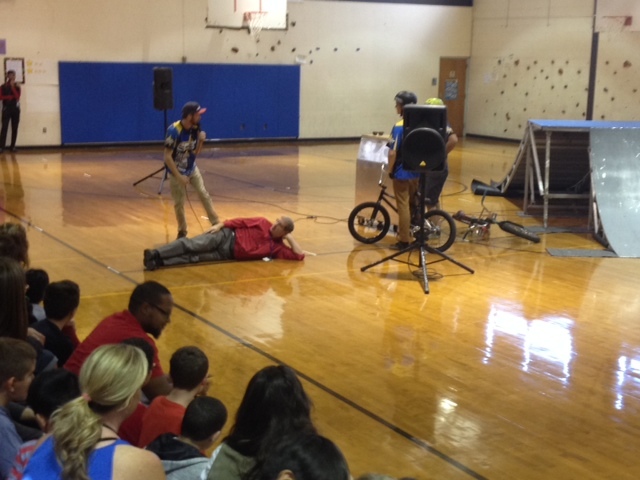 The cyclists have a system called the 3 Rs to emphasize their anti-bullying message. The 3 Rs are: Recognize, Refuse and React. The video below at right demonstrates one of the final tricks where students were cheering on their teachers courage and bravery as one of the cyclists jumped over them on his bicycle! 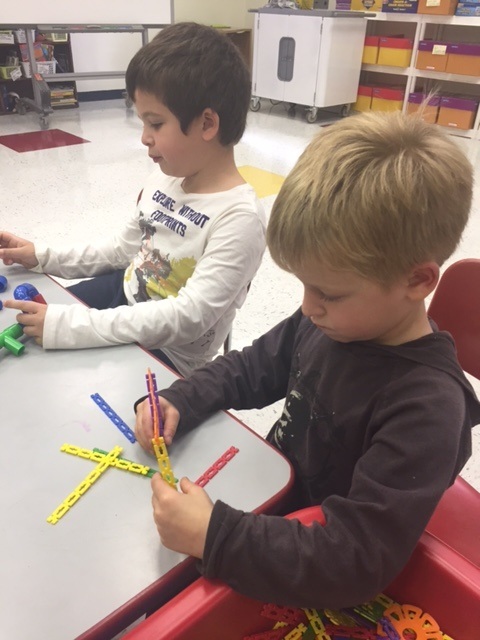 After viewing the videos, be sure to click on the photos for more information! 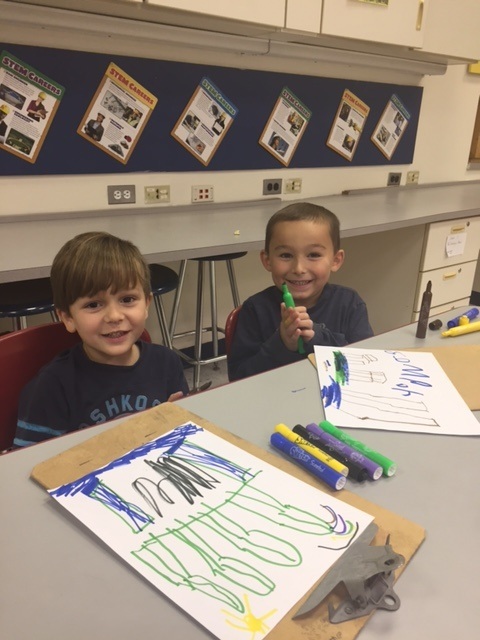 Both Cherry Hill and Roosevelt Schools participated in a collection for Table to Table on Wednesday, October 14th. 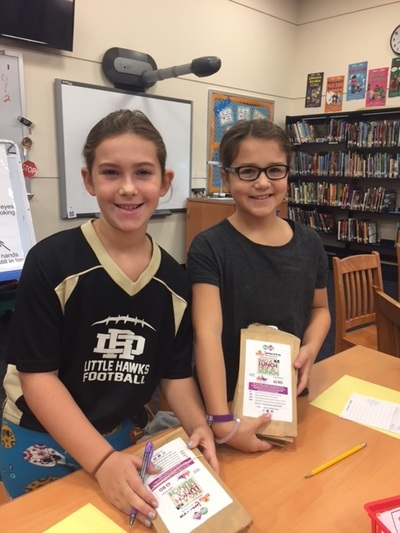 Students were asked to think about what they normally spend on lunch and donate to help hungry friends and neighbors in Northern New Jersey. A $5.00 donation helps deliver food for 50 nutritious lunches. This school wide activity was lead by Roosevelt's student council members. 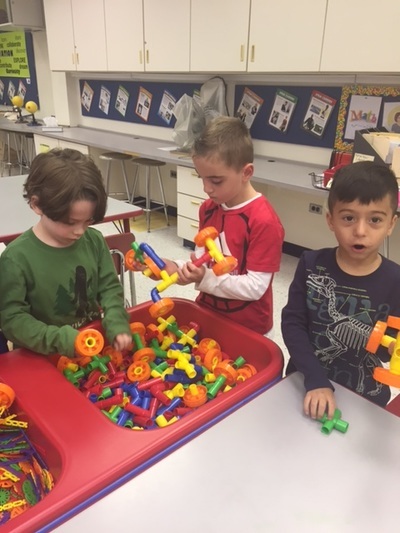 The River Edge School District is implementing a STEAM program in both Roosevelt and Cherry Hill Schools. STEAM integrates the disciplines of SCIENCE, TECHNOLOGY, ENGINEERING, ART and MATH. 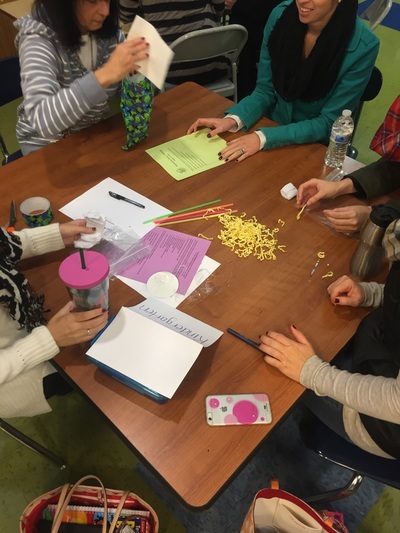 The program is designed to provide students with many opportunities for inquiry-based and integrative learning. Both students and teachers in River Edge benefit from the STEAM program. Recently, teachers from Roosevelt, New Bridge Center, and Cherry Hill schools participated in a professional development day on October 10th learning and engaging in STEAM activities. 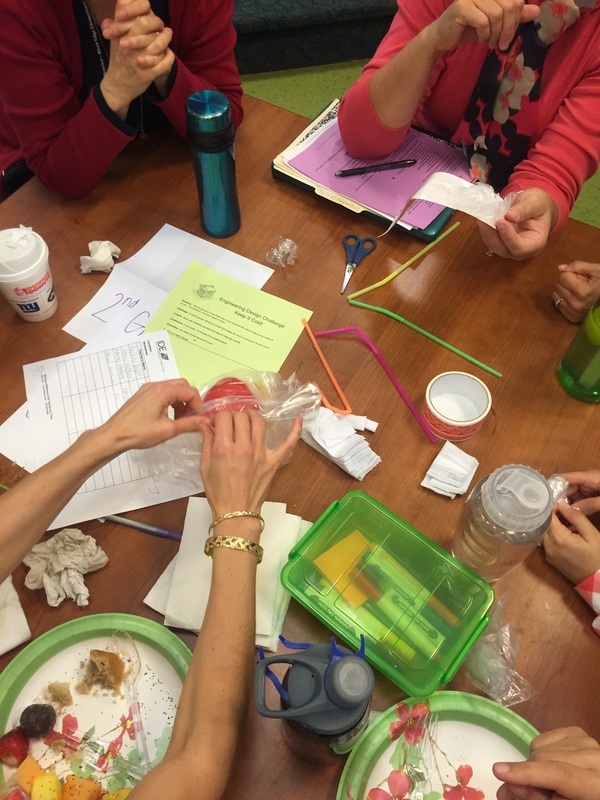 Teachers were challenged to design and build a cooler to keep ice cubes from melting. 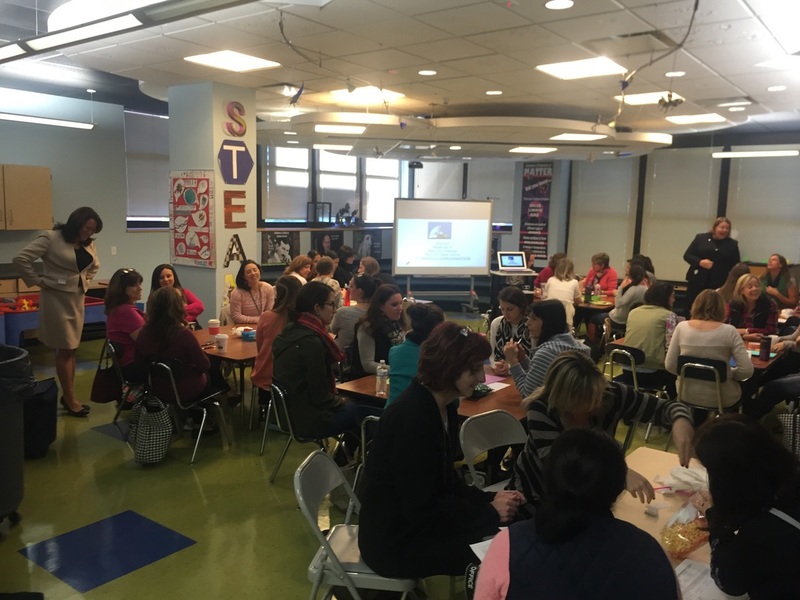 River Edge educators are very excited about the district's emerging STEAM program! 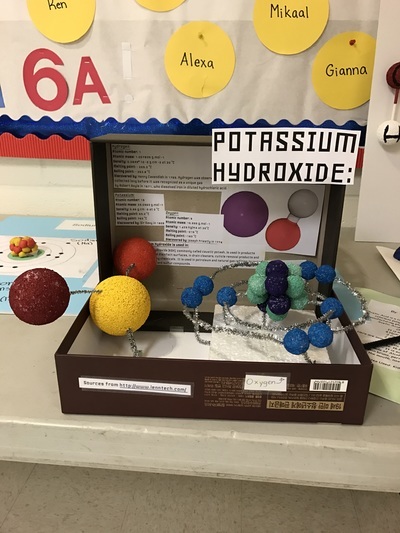 For more information on STEAM visit Spotlight on STEAM by clicking on the orange link. Below: Top row of photos show Professional Development for teachers in the STEAM Lab. 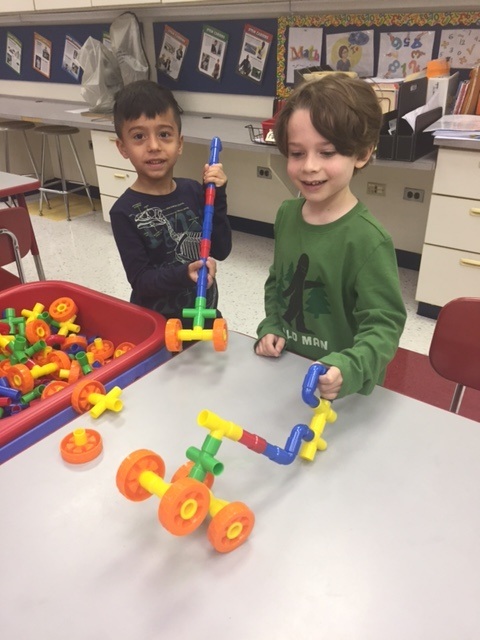 The lower 6 photos show a visit to the STEAM Lab by the Roosevelt Kindergarten students, where they were building or drawing bridges and automobiles after looking at examples. 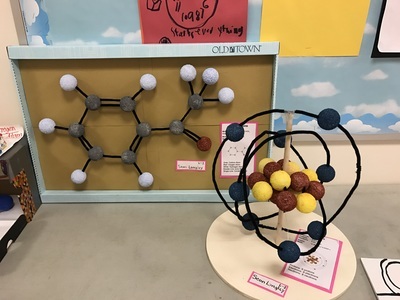 Recently, students were presented with the challenge of creating a three dimensional model of an element from the Periodic Table of Elements as well as a molecule made up of 2 or more elements. The projects encompassed the students' comprehensive knowledge and their diligence and creativity. Below are their projects!